Remove the fire alarm batteries! This is the special home cooking edition. Fun in the kitchen. Questions that I’ve thought about while standing in front of the oven, with hand on hip, full-on apron, and half-exploded baked goodness. Why are squashes so pretty? What dictates their color patterns? Genetics, pretty much. The most simple version? Mendelian genetics. Crash course? You’re welcome. EXAMPLE. Let’s say there’s two genes. G and g. G is the gene for being green. g is the gene for being…not green. Let’s say yellow. G is dominant over g, meaning, if G was paired with g, like Gg, the plant would be green. There’s two plants, the first has genes GG and the second, gg. First plant: GG (Homozygous dominant) Green. Second plant: gg (Homozygous recessive) Yellow. First plant meets second plant. They have a couple of great dates. They mate and have kids. (Figure 1). Figure 1. Plant 1 mates with Plant 2. Color is the phenotype (what you see). The kids they produce are all Gg (Heterozygous). The kids are all green. 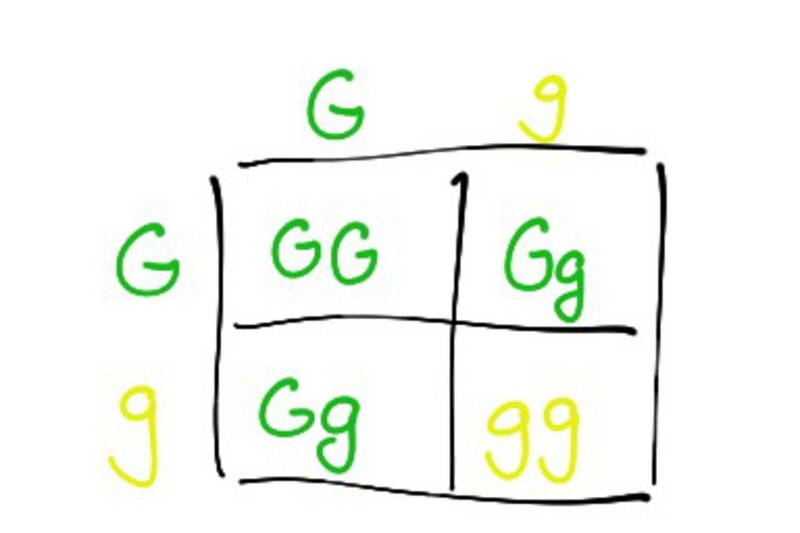 Remember G is dominant over g in the phenotype. Some of the kids go through some infelicitous activity, and mate. (Figure 2). Figure 2. Inappropriate kid activity. Kids of the kids can now have the genotypes GG, Gg, or gg. The phenotypes will be 75% green and 25% yellow. Notice it’s a simple multiplication table. 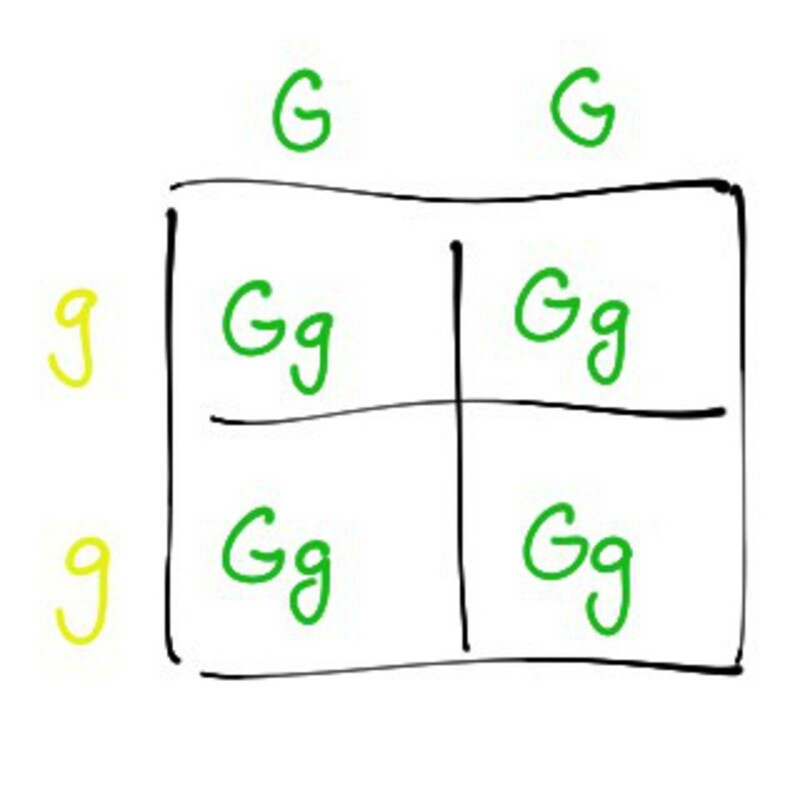 If G was not dominant over g, that means both G and g would end up in the phenotype. Thus a Gg plant would be green + yellow = lime-green. Genes are obviously not that simple. But where do you get stripes? To an extent, it’s just gene match and (mis) matching. Genes for stripes, no stripes, green stripes, lime-green stripes, half-stripes. Sugar and starch content, particular tastes and qualities all get crossed when plants mate n’ all that jazz. It’s all in the genes. I recommend…eating seasonally. How to avoid drying out ground beef. I’ve tried several methods of cooking ground beef in order to not dry it out. I’ve tried hot pan start (most meats), cold pan start (pork chop start), tiny bit of broth (restaurant secret), vigorous stirring (scrambled eggs), long-braises (stew), patty form, meatball form, and help from vegetables and starches. It seems the consensus of all this unscientific, subjective testing was that ground beef basically acts like…meat (great observation, I know). Mold it into a piece, or leave it in pieces. But surface area dominates. 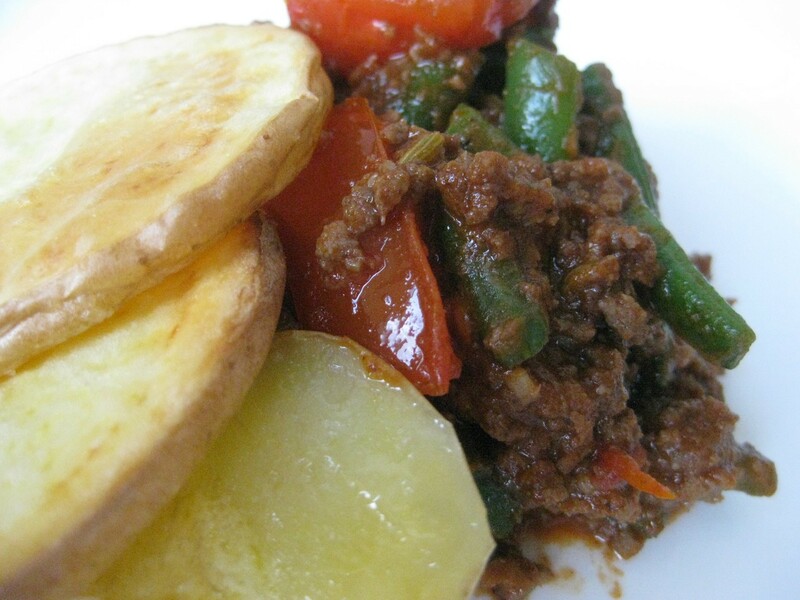 Chips n' mince. Ground beef had help from a little broth, some tomatoes, tomato paste, and green beans. Some salt, and off the heat when ready. My physics teacher back in high school always said, “when in doubt, the answer is surface area…or C, if its multiple choice.” (He changed “C” to “D,” to other various letters of the alphabet, week by week.) Ground beef, when in small itty-bitty pieces, possesses a much larger surface area than a steak, given the same amount of meat. 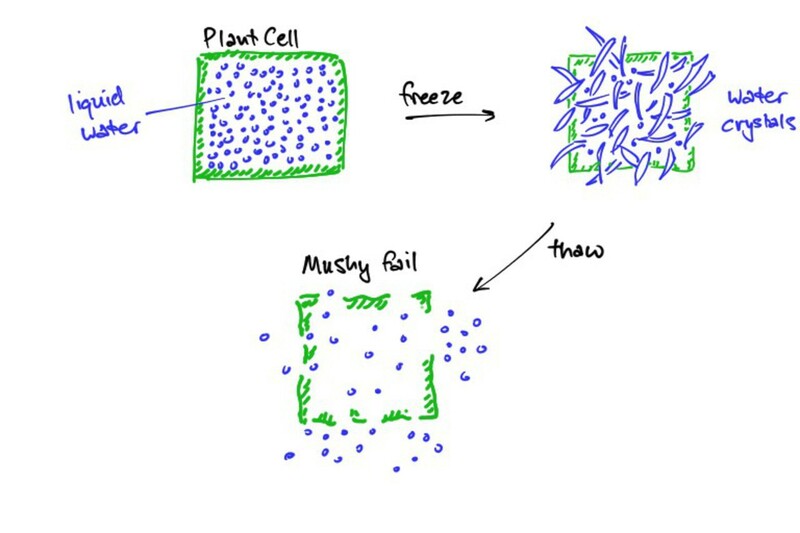 The more surface area, the more interface for heat transfer (so it cooks faster) but also, the more interface for water loss (dry). The finer the meat, the quicker it cooks. So it’s going to need help. Add fatty bits, vegetables, starches, stuff it into peppers, or decrease the surface area by molding it into meatballs or patties. Oh, and don’t obliterate it with too high a heat or too long of a heat. Which side has more black lines? More lines, more surface area. Bacon bubbles? Soapy bacon? Or something else? 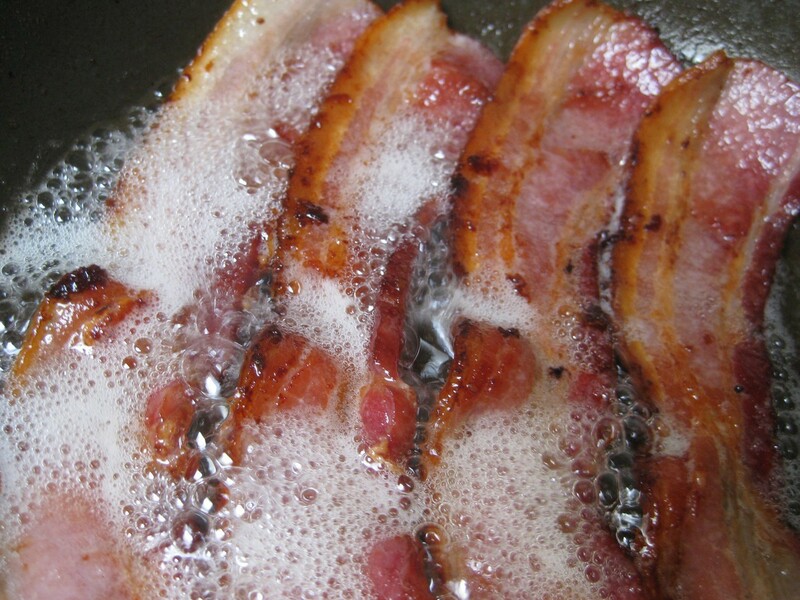 Bacon bubble bath. Rejuvenate NOW. Many liquids can create foams. They’re usually dictated by how sturdy that particular liquid is at holding its shape. Fat, does not hold its shape very well at all. (exception: they do when emulsified with the help of egg yolk). The interface (the place where oil touches air), for oils is very weak, as fat tends to spread itself when it comes into contacts with air. Bacon bubbles? They’re no foam, but rather an “artifact” of steam/hot air that is temporarily trapped in a transient interface of fat. The bubbles don’t stick around after the bacon is done cooking (partially because there’s no more heat…and because there’s no bacon either. Om noms). 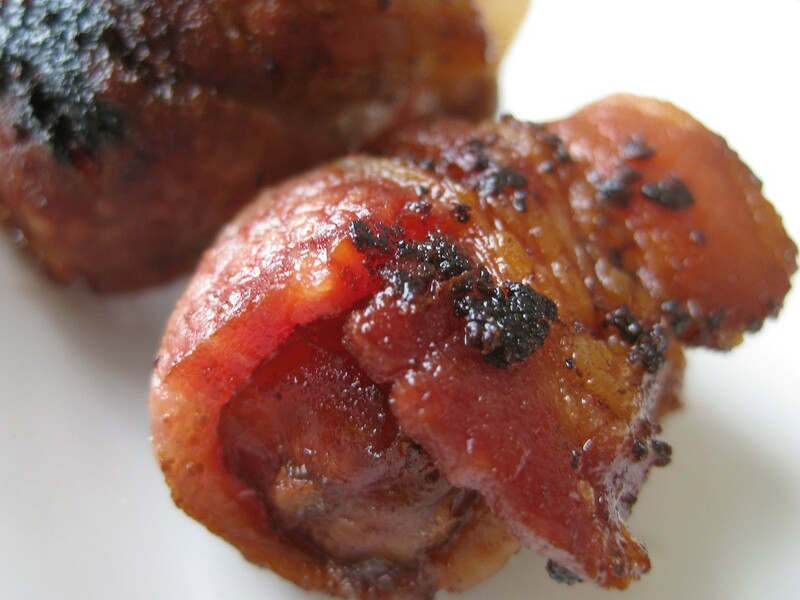 The cloying combination of bacon, and dates. I love bacon. I love dates. I love em’ together. Is there science behind why they’re good together? It’s not scientifically rigorous, but I can perhaps think of an example to why the combination might be good. To clarify this, I’ll use an example. Heinz ketchup was created for the purpose of a condiment that “hit all the buttons.” Apparently, Heinz’s ketchup is the perfect combination of salty, umami, sweet, sour, and bitter. I personally can’t taste the bitter component (then again I haven’t had ketchup for a while now). Either way, the point was that Heinz found a way to push all your buttons. In a similar fashion, I believe the bacon date combination also pushes a similar set of buttons. The cured bacon is salty, smoky, and savory, which hits the salty and umami buttons. Beyond that, the texture is crispy, slightly greasy, and there is definitely a degree of caramelization as well. +1 for texture and Maillard. The dates are sweet, and when heated, turn super soft and chewy (sugar bonds begin to break), which resembles textures like smooth cakes and buttery mashed potatoes. Looks like we got sweet, and another +1 for that smooth, puree-like texture. (Do we have some propensity for not chewing food?) That to me, is a solid 4-5 aspects of JUST a bacon wrapped date, not even including the unsupported evolutionary primal desire for smoky meats. Contrast that with eating a dry chicken breast. Not salty, not bitter, not sweet, hope to god it’s not sour, definitely nothing umami about it, not soft, not moist, not fatty, maybe a redeeming crispy chicken skin, but if that were there, I’d just eat the skin. Frozen slushie grapes and the point of no return. 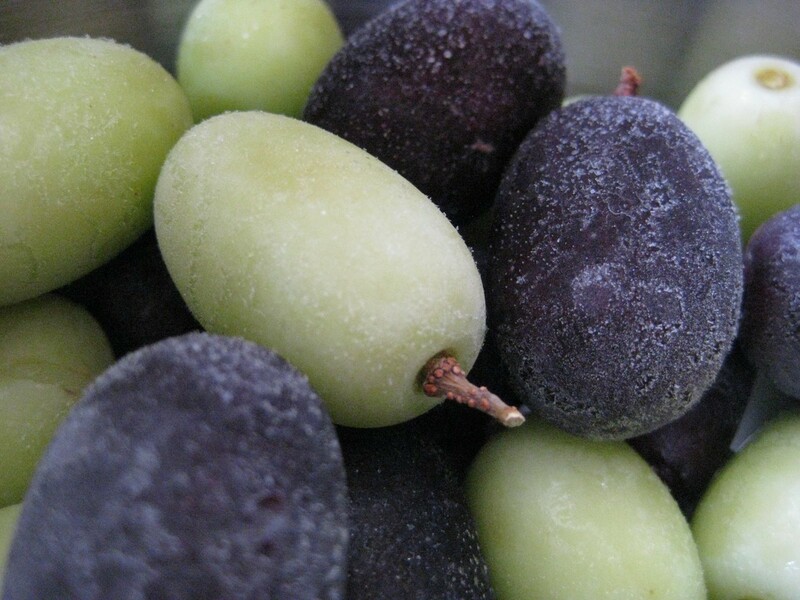 I have to say frozen slushie grapes (basically frozen grapes) are a pretty awesome treat. When I was a kid, I used to have frozen grapes, and then pour Sprite into a small bowl of these goodies, and just spoon it in. It was quite awesome. It was like…fruit cereal? Anyway, this question deals with what happens when you THAW out frozen grapes (or any other frozen fruit). Lemme tell ya’. It ain’t pretty. Water expands when frozen because it forms a crystalline structure that is less dense than liquid water. This crystalline structure will form small crystals or large crystals depending on how cold the ambient temperature is, and how much time the fruit is exposed to frigid temperatures. Longer times in cold temperatures will tend to form large ice crystals (the water has more time to move, before all kinetic energy is lost and they freeze in place). Shorter times in cold temperatures will form smaller ice crystals, as they have less time to move before all kinetic energy is lost. The only way to create a “shorter time” is to make it colder. Kinetic energy in the water is lost faster this way, thus a colder temperature is an automatic requirement for shorter times. (This is why they blast-chill freshly caught fish. Water freezes out super fast, so it doesn’t have time to create beautiful, large…penetrating crystals). How your fruit loses against water in an arctic showdown. 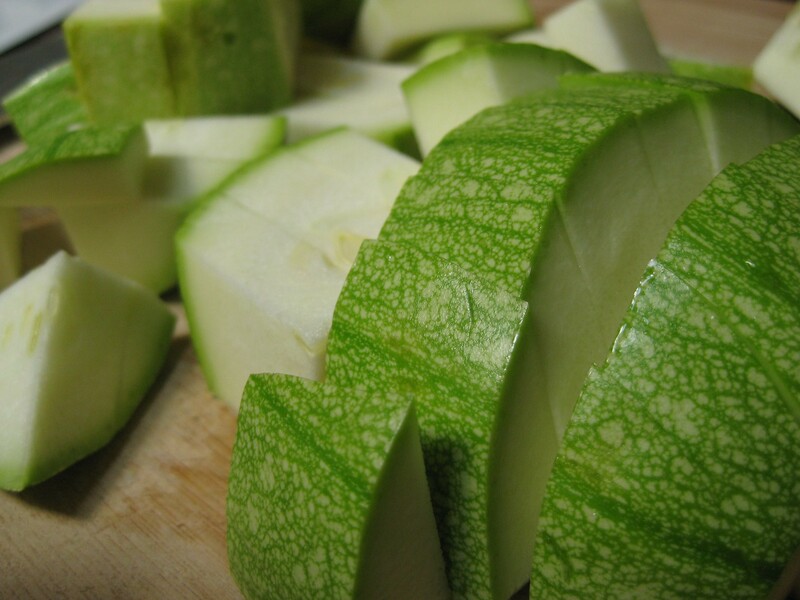 When water forms large crystals, they penetrate the cell walls of the fruit, basically perforating them. When the fruit thaws, all of its cells would be punctured, leaking like crazy, and when millions of these cells are all punctured and leaking…you get mushy, gross-looking fruit. Certainly not a charmer. Smoothie time. I had half the mind to peel it off my car and put it in a baggie. But no, I didn’t. It’s still on my car. Homage, I guess, to my half (or fully) squashed idea. (or my superb speeding skills on the I-5). But that raises an interesting tidbit about the sustainability of certain crops and animals. I’m not an expert on sustainability, but from what I’ve read, seen, and heard, there are perhaps some prevailing hypotheses out there. Grain agriculture is ultimately unsustainable. Animals that are fed on said grain agriculture are also just as unsustainable. There is already enough food to feed everyone on this planet, although the planet is slowly dying, (AND there are hungry people). Utilizing and re-utilizing land for grass-feeding animals and re-tilling/nutrient repletion of the land IS sustainable. Learning where our food comes from IS sustainable, as long as we respect and implement that knowledge. Supporting local farms, if everyone upped and did it, IS sustainable…eventually. That being said, my best homemade recipe below. 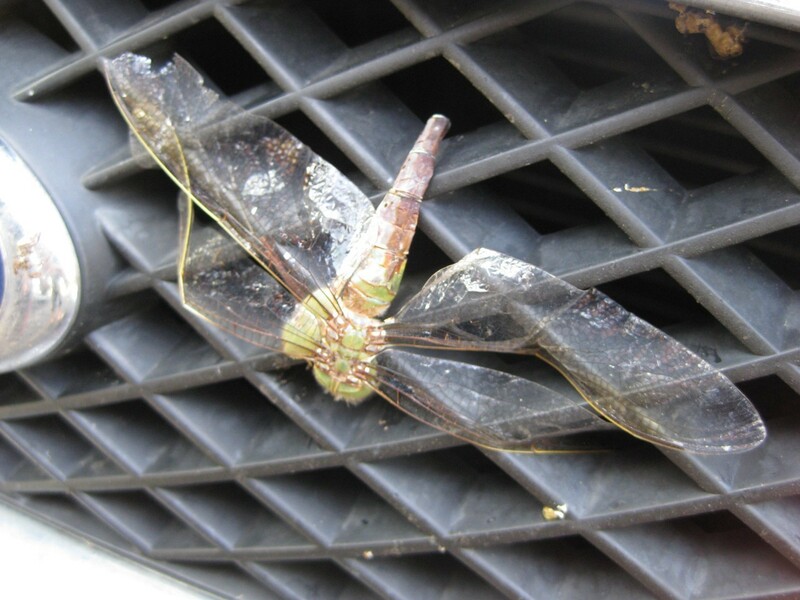 Dragonfly into eggwash, into spicy nut flour. Shallow fry in some olive oil. Replace croutons in salad. Serve to friends and/or significant others. Hilarity ensues. (Or slaps, break-ups…divorces). Disclaimer: Frank and his non-existent crew of food folks are not responsible for any physical, emotional, spiritual, or mental injury, embarrassment, and/or debauchery associated with the above recipe. Something’s burning in the oven. Good thing I removed the fire alarm batteries.